What better way for an artist to share the Holidays with friends than to send them original art as a Christmas card? The ability to reproduce multiple copies make etchings an ideal medium for this purpose. Many members of the Chicago Society of Etchers found this to be true. We have organized ten Christmas cards from our collection that illustrate the range of CSE artists. Eight of the artists in this post were CSE members. Two were not – Ruel Tolman and Charles Rosenthal . Tolman, in his various roles at the Division of Graphic Arts at the Smithsonian, was a major supporter of the CSE. Charles Rosenthal printed many of the cards in this collection, was a student of several CSE members and the father of this author. The cards are a tribute to the art form but also to the enduring nature of art. After all, how many Christmas cards are saved for 80 plus years? Bertha Jaques was one of the original founding members of the Chicago Society of Etchers and it’s Secretary for 27 years. She was the driving force responsible for making the CSE one of the most respected art organizations of the early 20th Century. She was both an accomplished poet and artist. Her 1912 Christmas card illustrates this fact. Even though it is not an etching, any collection of Chicago Society of Etchers works would be incomplete without her contribution. Tolman was a practicing artist working in etching, lithograpy, drypoint, mezzotint, oil paint and watercolor. 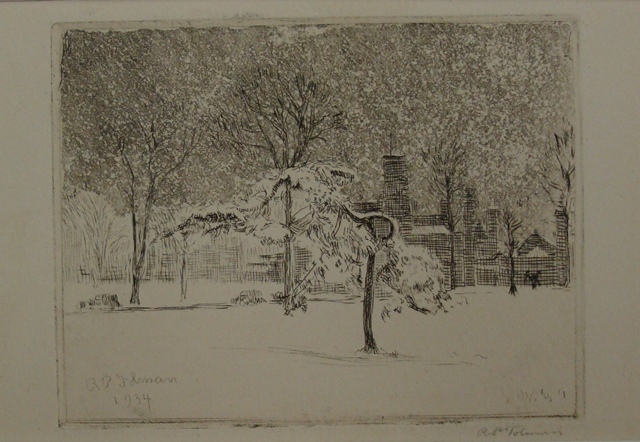 This etching depicts the facade of the Smithsonian in a snowstorm – a perfect winter and Christmas image. Tolman was a very influential figure in the 1930’s and 1940’s in the American art scene. He and Bertha Jaques were close personal friends and often cooperated on projects. The Chicago Society of Etchers donated over 600 etchings to the Smithsonian during his tenure. 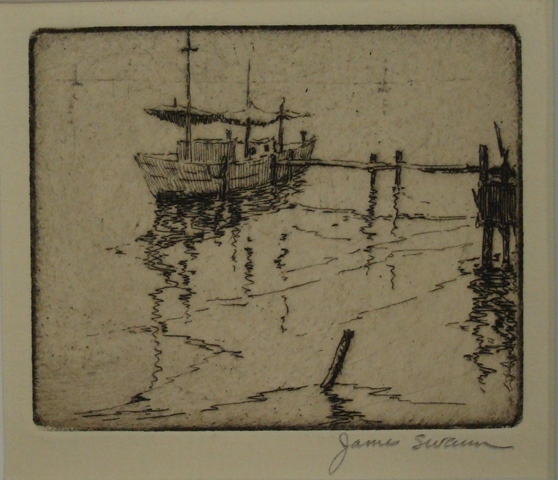 Jaques and Tolman helped plan the one man show for James Swann at the Smithsonian in 1938 that was a major boost to Swann’s etching career. R. H. Palenske had an uncanny ability to produce art that people liked. Unlike most of his contemporaries creating etchings during the 1930’s, he made his living entirely from the sale of his art. Other artists generally had other jobs that paid the bills and did fine art in their spare time. This Christmas card is a great example of Palenske’s work. It combines the common experience of leaving church on Christmas morning to return home, the nostalgia of a horse drawn sleigh and an idyllic winter wonderland of snow. Ernest Roth was one of the masters of architectural etching. His subjects ranged from European cathedrals to American landmarks. 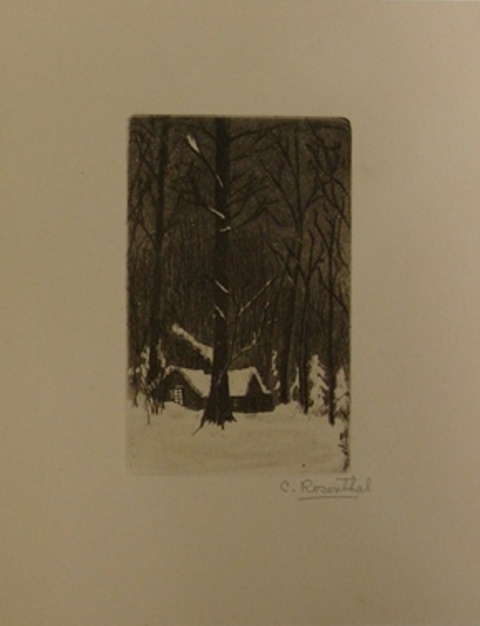 He won prizes for his etchings in the Annual CSE exhibits in 1914, 1919, 1936, 1938 and 1956. This New York composition conveys the hustle and bustle of the city, the quaintness of a local neighborhood and economic power of towering skyscrapers extending beyond the upper edge of the the etching. F. Leslie Thompson was best known for his color etchings. 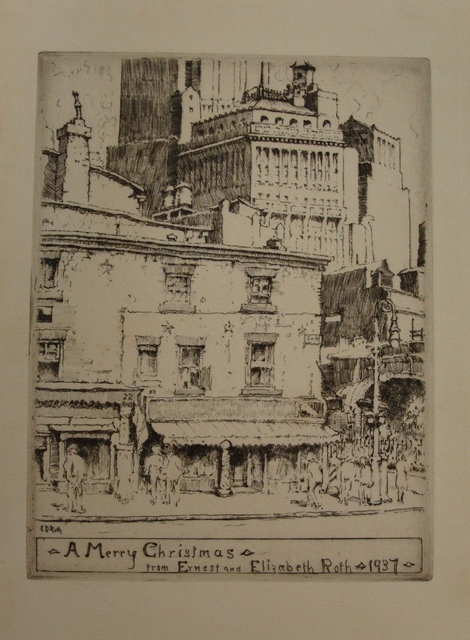 However, as shown in this Christmas card he could create a mood and feeling with the etching needle. The Dutch have a word that is untranslateable in other languages – “gezellig.” It conveys a homey, cozy, comfortable, and inviting atmosphere. 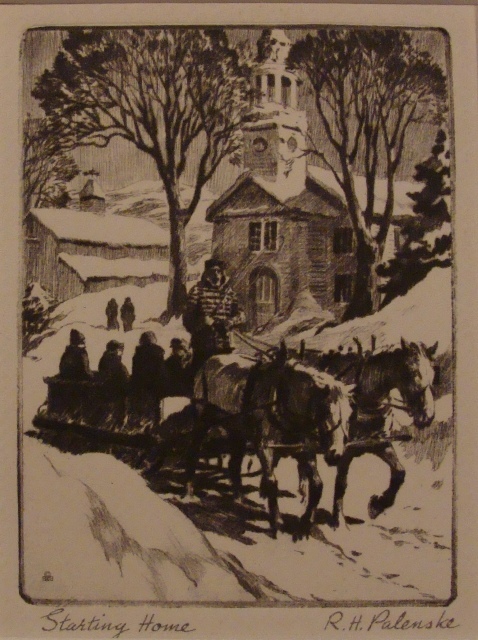 Thompson captures this spirit with the warmly dressed men greeting each other at the arch, the child running to add his welcome and the open door revealing a brightly lit, well decorated home for the Christmas season. The card is truly gezellig. 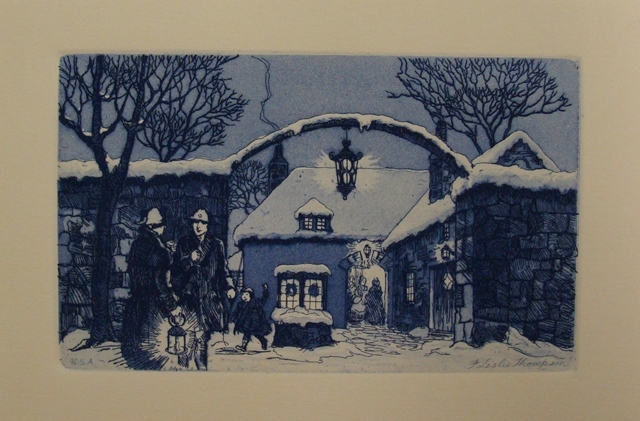 Leon Pescheret was another master of the color etching and developed his own technique. Bertha Jaques in a 1937 letter to Ruel Tolman had this to say about him: “Pescheret’s restraint and taste in his color prints surprises me and I do not wonder that they sell readily.” In his later life Pescheret moved from Chicago to settle with his wife in a home and studio in Whitewater, Wisconsin. The Pescheret’s liked to travel. 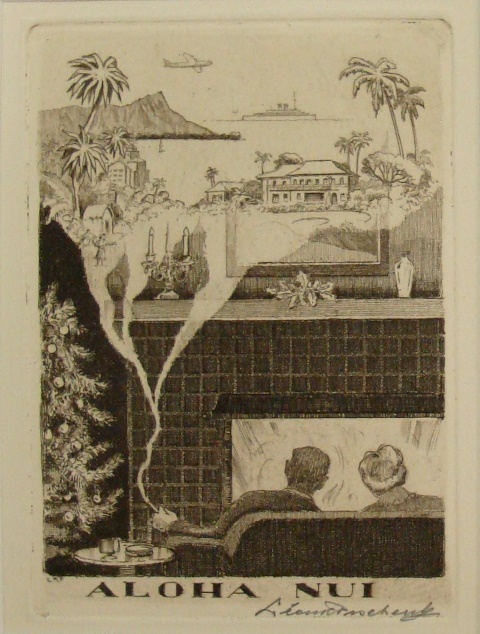 Perhaps this scene is from their well decorated living room with roaring fire and fond memories of beautiful Hawaii rising up from his cigar. The etching tells a story. And better than a Christmas card letter any day. Charles Rosenthal began his art career by working for his father, Henry Rosenthal, Sr., in the late 1920’s and early 1930’s. Henry had a business printing etchings located in the Tree Studios Building in Chicago. To create an etching print three things are required – the drawing with the needle into the “ground” on the prepared copper plate, the “biting” of the plate with acid to create the image and the printing of the actual etching onto paper. Most artists begin with the first stage. Rosenthal began with the last. He learned a great deal from the artists he printed for. In addition, he took lessons from the same Morris Henry Hobbs that was James Swann’s mentor and teacher. 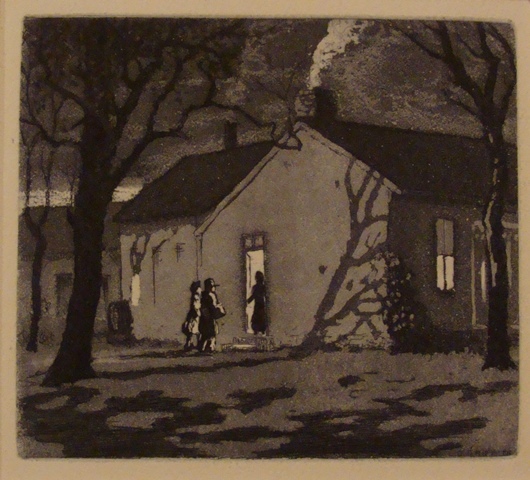 This etching is the first Rosenthal created. He would not do another for 50 years when he resumed his etching career while living in Arizona. He became a juried member of the Arizona Artists Guild and most of his etchings focused on a Western United States theme. Born in Indiana but raised in Dallas, L. O. Griffith maintained a lifelong connection to Texas through his mentor, Frank Reaugh. But early in his career he moved to Chicago and was a founding member of the Chicago Society of Etchers. He later moved to Brown County, Indiana and was instrumental in starting the artist’s colony there. Much of his work has a Mid-Western regionalist theme. 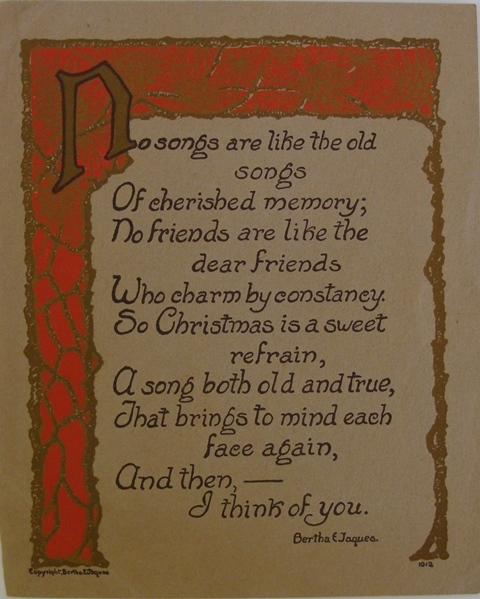 At first glance this Griffith Christmas card looks very typical with a hostess greeting her Christmas guests, but it has a much more important meaning. The hostess is in an open SIDE door. Guests would come to the front. The distance between the visitors and the homeowner suggests that they do not know each other. The posture of the couple looks like they have just asked for something (food perhaps) and are awaiting a response. (Remember this etching was produced in the middle of the Great Depression.) Griffith is telling us something. Christmas is not just about Christmas trees, egg nog and presents. It is about charity and concern for one’s fellow man – a deep thought for a simple card. That’s what makes it great art. 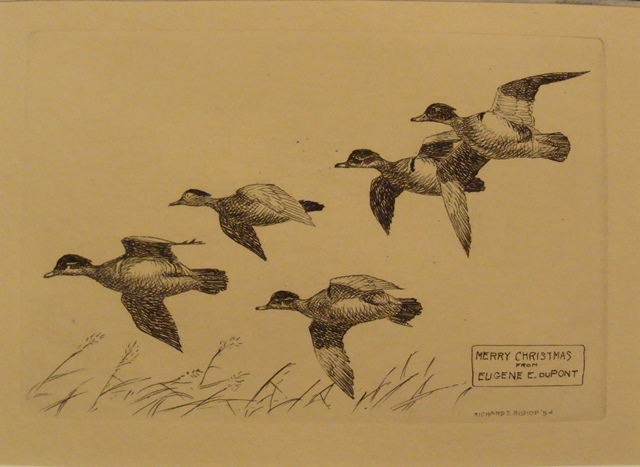 Wildlife (and particularly waterfowl) were extremely popular subjects for etchers from the CSE. Frank Benson and Richard Bishop were the two best known for this genre. Bishop made a study of birds in flight and even went the extra step of examining their wing patterns when they were flying with the use of motion pictures. Bishop’s etchings were very popular with the general public. They were equally popular with the rich and famous. This Christmas card was created for Eugene DuPont of the DuPont Chemical family. It is not only an uplifting Christmas card – it is also an excellently executed work.